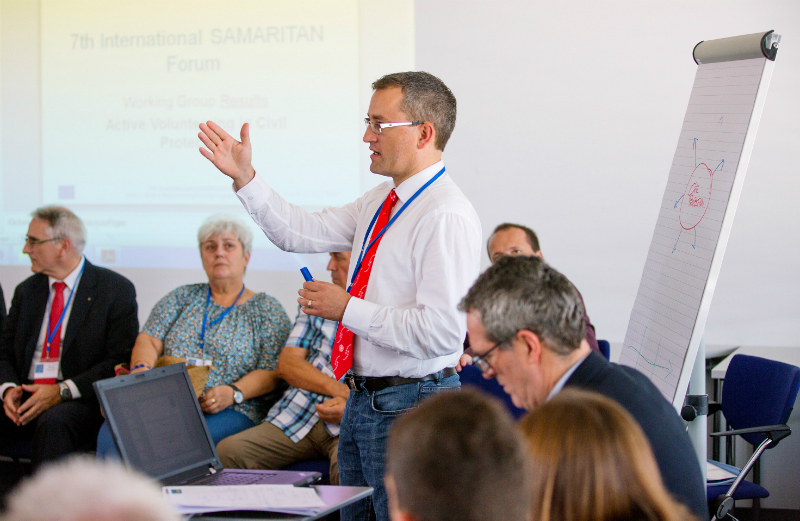 SAMARITAN Forum 2013 – AVEC | SAMARITAN INTERNATIONAL e.V. The 2013 Forum took place on 22nd August 2013 right before the 125th ASB anniversary at the new ASB representative office in Berlin under the motto „AVEC“ – Active Volunteering for a European Civil Society. About 120 participants from almost 20 international organisations were present. 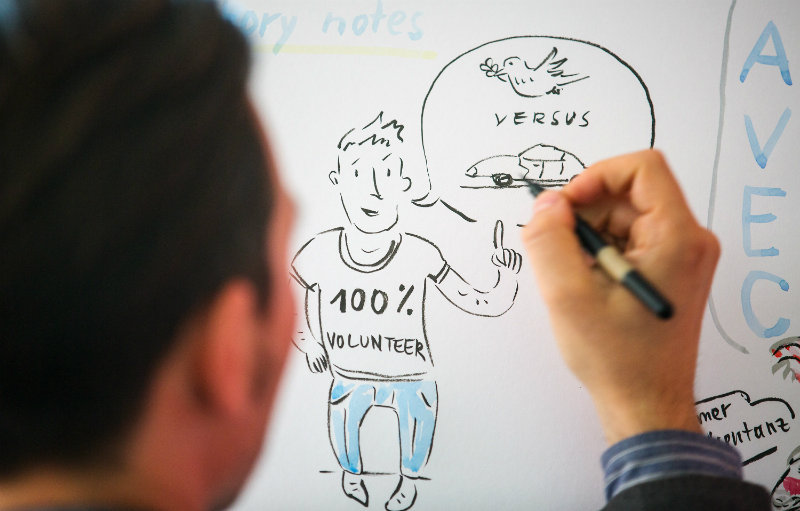 The Forum in Berlin was the kick-off for the conference series AVEC (Active Volunteering for a European Civil Society) which puts voluntary commitment first, considering the more than 130,000 volunteers in our member organisastions. In times of increasing scarcity of resources, demographic and social change as well as an increasing number of natural disasters the member organisations see themselves confronted by a special responsibility to foster closer cohesion of civil society – across borders and between generations and cultures. To rise to these common challenges, they wish to pool their resources in common fields of activities, to jointly represent their interests and to learn from each other through the exchange of best practices across borders. A particular concern the SAM.I. members share in this context is the inclusion of people who are disadvantaged due to age, special needs or life situations. The question of appropriate approaches in this matter was also considered in connection with the recent European Years: The European Year of Volunteering (2011), European Year for Active Ageing (2012) and the current European Year of Citizens. The event brought together poltical and project-based cooperation from 15 countries. Together with guests from other European civil society organisations and networks in volunteering, such as CEV, Volonteurope or SOLIDAR, roughly 120 Samaritans debated the issues “Quality in Volunteering”, “Active Volunteering in Civil Protection” and “Civic commitment in domestic care settings” and defined first steps to deepen their cooperation. The groundwork laid at this year’s Forum is planned to continue over the next two years with additional events under the AVEC motto. “The exchange of experiences from practical projects is highly important and of great significance for the success of future projects” stressed Knut Fleckenstein, President of SAMARITAN INTERNATIONAL and chairperson of ASB Germany. Which framework conditions are necessary to continue to motivate people, regardless of age or life situation, for voluntary civic commitment? How can migrants and the elderly, as a target group as well as as a supplier of voluntary services, be included to a greater extent? How can cross-border cooperation be utilised more effectively, considering the common challenges in the European context? These and further questions were debated in a panel discussion with guests from Brussels, experts in volunteer work and active volunteers. went deeper into the issues touched upon during the panel discussion. The entire confernence was particular supported by Mike Klar. The Illustrator has a degree in visual communication with a focus on illustration and graphics and studied at Bauhaus-Universität Weimar and École d’art et de Design Genève and works as illustrator, live drawer and graphics designer. Since 2007 he is a member of the artist group ILLUMAT. The conference series will be continued in two workshop sessions in 2013 and 2014, and is planned to be concluded with a final conference in autumn of 2014 in Krakow.